The following events appear in Natural Awakenings – Westchester, Putnam, Dutchess NY, January 2018 Edition. Knitting –10:30am-Noon. Come to learn or finish a project. $30 six sessions. $10 drop-in. Materials provided. Sarah’s House of Health, 900 S Lake Blvd, Mahopac. 845.803.8028. SarahsHouseOfHealth.com. Vision Board Workshop – 10am-4pm. Set 2018 intentions. Powerful goal setting event. $69. Materials provided. Sarah’s House of Health, 900 S Lake Blvd, Mahopac. 845.803.8028. SarahsHouseOfHealth.com. Sanskrit and Nada Yoga, The Yoga of Sound, Workshop – 1-3pm. BYO notebook and clothes to move in. $30. beBhakti Yoga Center, 89 Dewindt St, one block off Main St, behind Library, Beacon. beBhaktiYoga.com. Quest Yoga Open House – Free massage demos and free yoga classes. Raffles. Visit website to see day’s program under workshops tab. Class space and massage slots are limited. Quest Yoga Arts, 11-13 E Main St, Mt Kisco. RSVP: 914.996.4286. QuestYogaArts.com. Strong Core & Open Hips Workshop – Charles Matkin will explain how to leverage the strength of one’s core to dig deeper into the tightness of hips. $30. Shambhala Wellness Center, 4 S Chestnut St, Beacon. 845.797.1487. ShambhalaWellnessCenter.com. Yoga Nidra – 10-11am. With Claudia Gukeisen. A guided relaxation bringing one’s mind into its restful, healing state suspended between awake and asleep. $20. Mt Kisco. 914.864.0462. Center4Healing.net. Information Session – Noon. Hear info about 200-hour Basic Yoga Teacher Training beginning in March 2018. Free. Quest Yoga Arts, 11-13 E Main St, Mt Kisco. Register: 914.996.4286. QuestYogaArts.com. Creating the New Year with Intention – 1-5pm. Set intentions for 2018 and look at the challenges and triumphs of 2017; craft intention candles. $35. DG Sanctuary. 2 Lagrange Ave, Poughkeepsie. 845.473.2206. DreamingGoddess.com. Native American Dance Demonstration – 3pm and 5pm. Space limited. Free. Quest Yoga Arts, 11-13 E Main St, Mt Kisco. Register: 914.996.4286. QuestYogaArts.com. 40 Days to Personal Revolution Program – 6pm. 992 Main St, Fishkill. Info/registration: FireFlyFishkill.com. What the Health… is Going on Your Plate? – Jan 10, 17, 24 and 31. 7:30-9pm. Four-part series. Cutting edge, evidence-based, personalized health planning program developed by Duke Integrative Medicine focusing on nutrition and nourishment. $30 materials fee. Katonah Library. Register: 914.232.3508. Sound Bath – 7:15-9pm. With Gina Kjek. Guided mindfulness meditation, crystal singing bowls, sonic tuning forks, rattles, chimes and tank drum and shruti box. Limited space. $40. The Temperance Center, 453 White Plains Rd, Ste 203, Eastchester. Must preregister/prepay: 914.793.2600. TheTemperanceCenter.com. Introduction to Foot Reflexology – 11am-2pm. $35. Sacred Space Healing Arts Studio, 436 Main St, Beacon. Donna Brickwood: 845.742.8494 . Info: SeekSacredSpace.com. Chaturunga, Updog, Downdog – 1-3pm. Attend a workshop based on practice mastery and alignment in vinyasa, experience adaptation for each body and expression of the pose. Empower one’s practice to move with ease. 992 Main St, Fishkill. FireFlyFishkill.com. Chronic Fatigue/Adrenal Fatigue: Fantasy Vs Reality – 1-3pm. Free lecture. Dr. Kaushik’s Ayurvedic and Naturopathic Clinic. Yellow Monkey Village, 792 Rte 35, Cross River. DrKaushik.com. Art of Joy and Inspiration – 1:30-4:30pm. With Patty Holmes. Yoga practice to increase prana and foster gratitude and joy. The Yoga Studio, Club Fit, 584 N State Rd, Briarcliff Manor. Info/fee: Audrey Brooks: 914.582.7816. ytayoga.com. Shoulder Opening & Strengthening – 4-5:30pm. With Charles Matkin. Using Asana, Pranayama and Guided Imagery to tap into the more gentle techniques for the shoulders and more. $40. Cold Spring Yoga Studio, 75 Main St. 845.265.4444. ColdSpringYoga.com. Tibetan Sound Bowl Healing – 5:30-7pm. With Michelle Clifton. A celestial harmony with a profound healing effect on the nervous system, mind, body and soul. Mt Kisco. Fee info: 914.864.0462. Center4Healing.net. Reiki Circle – With Deborah Amjadi. Take part in circle for a restorative reiki healing experience to reduce stress, relieve pain and accelerate healing without the use of medication. $20 cash. Mt Kisco. 914.864.0462. Center4Healing.net. Medium Anna Raimondi Book Signing – 1-3pm. Meet this well-known author and pick up a copy of her book. Synchronicity, 1511 Rte 22, Brewster. RSVP: 845.363.1765. Info: SynchronicityNY.com. Clarity Breath Workshop – 6:30-9:30pm. A powerful method to release inner stress, heal old wounds, repressed emotions and past traumas stored in one’s body. Quest Yoga Arts, 11-13 E Main St, Mt Kisco. Preregister: 914.996.4286. QuestYogaArts.com. Lightning Bugs Kids Camp – 9:15-11:45am. Ages 5-9. $20 per child. 992 Main St, Fishkill. FireFlyFishkill.com. Wellness Night – 7-8:30pm. Meet our practitioners and hear tips for staying well during the winter. Free BEMER sessions. Sarah’s House of Health, 900 S Lake Blvd, Mahopac. 845.803.8028. SarahsHouseOfHealth.com. Qi Gong Classes for Women – Jan 17, 24 and 31—with Feb 7 as a flex snow date. 6-8pm. Sacred Space Healing Arts Studio, 436 Main St, Beacon. $20 each class. Donna Brickwood 845.742.8494. Info: SeekSacredSpace.com. Tarot Wisdom Gathering – 6:30-8pm. May BYO Tarot deck. Each month a card will be chosen to discuss and journey into with open minds and hearts. $10. DG Sanctuary, 2 Lagrange Ave, Poughkeepsie. 845.473.2206. DreamingGoddess.com. Community Opioid Overdose Training – 12:30-2pm. Westchester County Department of Health offers a free training for the public on how to respond to an opioid overdose using Naloxone (Narcan). Somers Library. Register: WestchesterGov.com/health. Acro Yoga Fundamentals Workshop – Will set a solid and safe foundation that incorporates yoga, partner exercises, basic flying and Thai yoga massage. $25. Shambhala Wellness Center, 4 S Chestnut St, Beacon. 845.797.1487. ShambhalaWellnessCenter.com. Stretch Your Soul – With Julia Zern and Tara Gilman. Friday night yoga practice and kirtan. 992 Main St, Fishkill. Registration: FireFlyFishkill.com. 45th Annual Art Show: Bedford – 6:30-9pm/Preview Party/Jan 19; 10am-5pm/exhibition & sale/Jan 20–21, 1-5pm/Jan 26; 10am-5pm/Jan 27-28. Paintings, sculpture and photography by local artists. Party: $125 advance. $150 door. Free admission, other days. Bedford Historical Hall, Rte 22, Bedford. Info: ArtShowBedford.org. Spiritual Movie Night – 6:30-9:30pm. Movie followed by discussion with Reverend Deena/Angel. $35. Sarah’s House of Health, 900 S Lake Blvd, Mahopac. 845.803.8028. SarahsHouseOfHealth.com. Sound Healing & Tibetan Singing Bowls – 7:30-8:30pm. Michelle Clifton will play the singing bowls and awaken our bodies’ own innate healing abilities and re-tune our bodies. $25 donation. Cold Spring Yoga Studio, 75 Main St. 845.265.4444. ColdSpringYoga.com. Weschester Wholistic Wellness Danswell Expo – Multi-faceted health expo brings together local experts in support of physical, emotional, mental, spiritual and financial health in a soulful, fun and playful setting. Community Unitarian Universalist Congregation – White Plains, 468 Rosedale Ave. Tickets: TinyURL.com/Health-Wealth-Expo. Qi Gong for Beginners and Experienced – 9am-Noon. $25. Desmond Campus for Adult Enrichment, 6 Albany Post Rd, Newburgh. Register direct with the school: 845.565.2076. Online: msmc.edu/communityed. Reiki Level 2 Training – 10:30am-2:30pm. With Brett Bevell. Training in traditional Usui Mikao Reiki System. $250. Mt Kisco. 914.864.0462. Center4Healing.net. Sound Bath – 4:30-6:30pm. With Gina Kjek. Guided mindfulness meditation, crystal singing bowls, sonic tuning forks, rattles, chimes and tank drum and shruti box. Limited space. $40. The Temperance Center, 453 White Plains Rd, Ste 203, Eastchester. Must preregister/prepay: 914.793.2600. TheTemperanceCenter.com. Music Brunch at Wainwright House – 11:30am-2:30pm. The Gary Adamson Trio perform. Hear a variety of music overlooking Rye Harbor. $55 includes brunch by Corner Stone Caterers, wine, champagne and the concert. 260 Stuyvesant Ave, Rye. Registration: 914.967.6080. Candle Meditation Workshop – 3:30-6:30pm. Experience a powerful meditation using reiki candles as a co-creation tool to support the manifestation of one’s goals and intentions for the New Year. Quest Yoga Arts, 11-13 E Main St, Mt Kisco. Register: 914.996.4286. QuestYogaArts.com. All about Medical Marijuana – 7:30pm. Dr. June Chin discusses conditions that qualify for treatment under 2014 New York State law. Dr. Chin integrates medical cannabis to children and adults and has seen how it benefits patients. Rye Free Reading Room, 1061 Boston Post Rd, Rye. HolisticMoms.org. The Feminine Second Spring – Evolving with Grace, Vitality and Beauty through Perimenopause and Menopause, LES 453 – 9am-1pm. $49. Register directly with school: Dutchess Community College – South Campus, Wappingers Falls. 845.431.8910. Online: SunyDutchess.Edu/cfweb. Yoga Mini Retreat – 2-4pm. Bliss out, restorative yoga, aromatherapy, reiki, meditation with Mary Brennan. $40. Sarah’s House of Health, 900 S Lake Blvd, Mahopac. 845.803.8028. SarahsHouseOfHealth.com. Shamanic Reiki Hearth Circle – 5:30-7pm. With Melanie Ryan. Meditations, sharing, shamanic journey and group energy healing. 70 percent of proceeds go to preserving indigenous shamans’ teachings. $20 cash suggested. Mt Kisco. 914.864.0462. Center4Healing.net. Album Release Kirtan Party – 7pm. Sing, dance or just listen to the music, the tabla, the harmonium and the dulcimer. $15. beBhakti Yoga Center, 89 Dewindt St, one block off Main St, behind Library, Beacon. beBhaktiYoga.com. Monthly Meditation Circle – 10am. With Cheryl Sprague. Using variety of methods from singing bowls, drumming and more, attend this dedication to oneself and find peace and stillness in life. $15. DG Sanctuary. 2 LaGrange Ave, Poughkeepsie. 845.473.2206. DreamingGoddess.com. 5 Rhythms – 5-7pm. Movement is the medicine and metaphor, reaching across all languages, cultures/age groups to transform suffering into art, art into awareness and awareness into action. $25 donation. Cold Spring Yoga Studio, 75 Main St. 845.265.4444. ColdSpringYoga.com. The following events appear in Natural Awakenings – Westchester, Putnam, Dutchess NY, January 2017 Edition. New Year’s Fire Ceremony – 11am. Help to send the intentions collected on the yule wreath to the universe. Event takes place at another location; call for directions. Hands of Serenity Healing, Fishkill. 845.896.1915. HandsOfSerenityHealing.com. Michael Zeilnhofer Presents Ice Giants: Uranus and Neptune – 6:30-7:30pm. Crucial in the evolution of the solar system. Program intended for those ages 10 and up. Kent Library, 17 Sybil’s Crossing, Kent Lakes. Registration required: 845.225.8585. KentLibrary.org. Belly Dance Series – 6-7pm/intermediate; 7-8pm/beginner. With Ayleeza. Four-class series. $48 per series. DG Sanctuary. 2 Lagrange Ave, Poughkeepsie. 845.473.2206. DreamingGoddess.com. Yogic New Year – 2017 – 7-8:30pm. O2 Livings Annual, Yogic New Year chakra balancing, intention setting practice, with registered yoga teachers Deirdre Breen and Renee Simon. O2 Living Wellness Center, located in Yellow Monkey Village, 792 Route 35, Cross River. Info: Info/register: 914.763.6320. Reiki Master Class – Jan 7-8. 11am-4pm. With Reiki Master Marcus Feighery. $675. Synchronicity, 1511 Rte 22 Brewster. RSVP: 845.363.1765. Info: SynchronicityNY.com. Yoga for Women with Cancer – Noon-1:30pm, Open to women living with breast, ovarian or gynecological cancer. Free. Club Fit, 600 Bank Rd, Jefferson Valley. Support Connection/must preregister: 914.962.6402. SupportConnection.org. The Science behind Weight Loss – 12:30-1:30pm. With Dr. Timothy Morley, Medical Director of Tomorrow Medicine. Learn proper way to lose weight and keep it off. Free. Saw Mill East, 333 N Bedford Rd, Mt Kisco. RSVP: 914.615.9004. Info: TomorrowMedicine.com. A New Beginning: Living What Matters In 2017 – 1pm. With Diane Ingram, a Personal Certified Coach. Explore what really matters and learn how to develop personal growth. Free. Patterson Library, 1167 Rte 311, Patterson. Info: 845.878.6121 x10. PattersonLibrary.org. Sweat, Samadhi & Sankalpa – 4-6pm. With Deirdre Breen and Dr. Kaushik. Kick off 2017: yoga class incorporating a vinyasa practice and yoga nidra meditation. $40. Quest Yoga Arts, 11 E Main St, Mt Kisco. Register: 914.241.9642. QuestYogaArts.com. Monthly Shamanic Reiki Hearth Healing Circle – 5:30-7pm. With Melanie Ryan, SRMT. Proceeds go to EOMEC.org, a non-profit to preserve world-wide indigenous shamanic healing practices. $20 suggested. Drop in. Mt Kisco. 914.864.0462. Center4Healing.net. Free Intro to Ayurveda & Yoga Study Group – 6:30pm. Find out about our six-part lifestyle study group. Learn more about these ancient practices. Free. Quest Yoga Arts, 11 E Main St, Mt Kisco. Register: 914.241.9642. QuestYogaArts.com. Creating the New Year with Intention – 3-5pm. Look at the challenges and triumphs of 2016, discover what worked and what didn’t and more. Craft one’s own intention candle. $35. DG Sanctuary. 2 Lagrange Ave, Poughkeepsie. 845.473.2206. DreamingGoddess.com. Yin Yoga & Meditation – 5-7pm. Mind/body practice using longer (supported) holds in poses focusing on connective tissues in body not usually targeted. $35. Quest Yoga Arts, 11 E Main St, Mt Kisco. Register: 914.241.9642. QuestYogaArts.com. Men’s Group Open House – 7-8:30pm. Celebrate full spectrum of our authentic beings, as we reflect on and develop the true meaning and purpose of our lives. SunRaven, 501 Guard Hill Rd, Bedford. 914.218.3113. SlowMedicine.org. Young Living Essential Oil New Year Workshop: New Beginning to a Healthier You in 2017 – 6-8pm, Katonah. Learn how natural oils support physical, mental, emotional and spiritual well-being. Create a business with these oils. Register: 914.556.8258. Weight Loss Made Simple: Weiss Method Info/Lecture – 7-8pm. Learn about this amazing method for overcoming everyday addictions and easy, natural weight loss. Free. Briarcliff location. Reserve space: 914.705.1805. Weiss-Method.com. Parents of Teen and Adult Special Needs Students Support Group – 7-9pm. 2nd Wed. New group focuses on how to prepare them to become responsible, self-sufficient, confident young adults. 89 Main St, Brewster. Info, Emily Sussman: 845.363.8220. Chivalry and Martial Arts – Six-week series begins. Pay what is affordable. SkyBaby Yoga & Pilate’s Studio, 75 Main St, Cold Spg. Must preregister/info: 845.265.4444. SkyBabyYoga.com. Girls Yoga – Six-week series begins. Pay what is affordable. SkyBaby Yoga & Pilate’s Studio, 75 Main St, Cold Spg. Must preregister/info: 845.265.4444. SkyBabyYoga.com. Space Clearing & Protection – 6:30-8:30pm. With Alexandra Le Clere. $40. Synchronicity, 1511 Rte 22 Brewster. RSVP: 845.363.1765. Info: SynchronicityNY.com. Reiki II Training – 10:30am-2:30pm. With international Master Teacher and Author, Brett Bevell. Be initiated into the powerful, life-changing experience of Reiki, the world’s most popular form of energy healing. $250. Mt Kisco. 914.864.0462. Center4Healing.net. True Essence Connecting Circle – Jan 14, 28, Feb 11 and 25. 2-4pm. Two-month program. Shift vibration and awaken one’s true essence. Four-group meetings and four individual coaching sessions. Lighthouse Retreat and Wellness Center, Croton-On-Hudson. 845.424.6219. AwakenYourTrueEssence.com. Holistic Kids: Mystery Key Event – 3-4:30pm. Ages 4-7. Games, stories and crafts. Discover secrets to achieving optimal health. Snacks, face painting and more. Free. Quest Yoga Arts, 11 E Main St, Mt Kisco. Register: 914.241.9642. QuestYogaArts.com. Ayurveda: Depression and Anxiety: Cultivating a Chemistry of Joy – 3-5pm. Light refreshments served. Free. Dr. Kaushik’s Ayurvedic and Naturopathic Clinic, Yellow Monkey Village, 792 Rte 35, Cross River. Info: 914.875.9088. DrKaushik.com. Girls Pilates – Six-week series begins. Pay what is affordable. SkyBaby Yoga & Pilate’s Studio, 75 Main St, Cold Spg. Must preregister/info: 845.265.4444. SkyBabyYoga.com. 200hr Yoga Teacher Training Open House – 12:30-1:45pm. Next part-time teacher training begins Feb 19-May 7, 2016. Bring a friend. $3,000. Early bird special will still apply $2,800. Nueva Alma Yoga and Wellness, 799 McLean Ave, Yonkers. NuevaAlma.com. Restorative/Yin/Yoga Nidra Workshop – 2-4:30pm. Designed to manifest the best year of one’s life. $40. Nueva Alma Yoga and Wellness, 799 McLean Ave, Yonkers. NuevaAlma.com. Holistic Kids: Mystery Key Event – 3-4:30pm. Ages 8-10. Games, stories and crafts. Discover secrets to achieving optimal health. Snacks, face painting and more. Free. Quest Yoga Arts, 11 E Main St, Mt Kisco. Register: 914.241.9642. QuestYogaArts.com. Restorative/Yin/Yoga Nidra Workshop – 5-7:30pm. Designed to manifest the best year of one’s life. $40. Nueva Alma Yoga and Wellness, 799 McLean Ave, Yonkers. NuevaAlma.com. WHN Monthly Meeting – 9:30-11am. CBD: The Miracle Cure Big Pharma Wants to Control. With guest presenters, Andy Kadison and Shira Adler. Westchester County HMN Special Event: Katonah United Methodist Church. 5 Bedford Rd, Katonah. Info: WestchesterHolisticnetWork.org. Weiss Method Treatment Day Westchester – 1-7pm. Free oneself of daily habits and addictions with the revolutionary help of the Weiss Method. Addiction Free Naturally. Reserve space: 914.705.1805. Weiss-Method.com. Setting Your Intention & Clearing Space for the New Year – 6:30-8pm. With Lisa Rieckermann. Make room for a joyful and peaceful New Year. $20. Walk a Sacred Path Healing Center, 2279 Rte 22, Dover Plains. Info: 914.329.3325. Katonah Study Group: Intro to Dosha Coaching – 7-9pm. Elements and actions of personalized health with Deirdre Breen. Participants will discover their Dosha and its constitutional (prakriti) and lifestyle (vrikriti) expressions. Location: Northern Westchester Hospital. Info: bonnie@katonahstudygroup.org. All about Metabolism – 7:30pm. Dr. Timothy Morley, functional medicine physician, will speak about how balancing hormones and insulin levels optimizes health and sustains weight loss. Rye Free Reading Room, 1061 Boston Post Rd, Rye. HolisticMoms.org. The 72 Archangel of the Kabbalah: Discover Your Birth Angel Workshop – 7-9pm.With Shaman Elka Boren. $35. Synchronicity, 1511 Rte 22 Brewster. RSVP: 845.363.1765. Info: SynchronicityNY.com. A Slow Medicine Approach to Abundance Workshop – 10:30am-4pm. Learn skills to understand how one could be blocking oneself and more. $225 couples. $150 individuals. SunRaven, 501 Guard Hill Rd, Bedford. 914.218.3113. SlowMedicine.org. 13 Moons Women’s Intensive Medicine Circles – 11am-5pm. Teaching circle reflecting accumulation of over 30 years of conscious learning, exploring and experiencing. First class Sat, following months Sun. $1100. DG Sanctuary. 2 Lagrange Ave, Poughkeepsie. 845.473.2206. DreamingGoddess.com. Connecting to Source – 1:30-4:30pm. With Jeffrey Migdow. Meditation, postures, mantra and sound to facilitate healing and more. $45 members. $65 nonmembers advance. The Yoga Studio, Club Fit, 584 N State Rd, Briarcliff Manor. Info: Audrey Brooks: 914.582.7816. YTAyoga.com. Donation Based Community Yoga Class – 3-4:15pm. Open level. All welcome. Bring a friend. Nueva Alma Yoga and Wellness, 799 McLean Ave, Yonkers. NuevaAlma.com. Free Dosha Analysis: Pulse and Tongue – 3-5pm. With Dr. Somesh Kaushik at the grand opening of the new Katonah Pharmacy. Where Mrs. Green’s used to be, across from Awakenings, 202 Katonah Ave. 914.232.2300. DrKaushik.com. Awakening to Mediumship & Open Channeling – 5-6:30pm.With Elka Boren. $35. Synchronicity, 1511 Rte 22 Brewster. RSVP: 845.363.1765. Info: SynchronicityNY.com. Finding Peace in Chaos – 10:30am-4:30pm. With Melanie Ryan, LCSWR. Day of silent meditation. No experience necessary. Sitting and walking meditation instruction. BYO lunch. 50 percent of proceeds go to SomethingGoodInTheWorld.org. Mt Kisco. Register: 914.864.0462. Center4Healing.net. 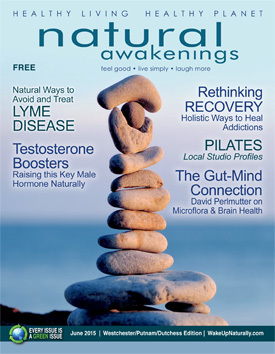 Addiction Free Naturally: Weiss Method Info-lecture NYC – 1-2pm. Learn about this amazing method for overcoming everyday addictions. Free. NYC location, E 37th, btw Park and Lex. Reserve space: 914.705.1805. Weiss-Method.com. Crystal Workshop – 5-6:30pm. With Elka Boren. $35. Synchronicity, 1511 Rte 22 Brewster. RSVP: 845.363.1765. Info: SynchronicityNY.com. Restorative Yoga – 5-7pm. With Karla Booth Diamond. Relax and letting go of the “have to’s” and the “shoulds” is essential to health and well-being. Quest Yoga Arts, 11 E Main St, Mt Kisco. Register/cost: 914.241.9642. QuestYogaArts.com. Balance Your Hormones, Balance Your Life – 6:30-7:30pm. With Dr. Timothy Morley, medical director of Tomorrow Medicine and hormone balancing expert. Free. Saw Mill East, 333 N Bedford Rd, Mt Kisco. RSVP: 914.615.9004. Info: TomorrowMedicine.com. Strengthening Your Immune System with Whole Foods and Herbs – 6:30-8pm. Use whole foods to obtain powerful nutrients, revitalize cells, cleanse toxins and more. $20. Walk a Sacred Path Healing Center, 2279 Rte 22, Dover Plains. Info: 914.329.3325. Ayurveda and Yoga Lifestyle Study Group – 1-2:30pm. 1/26, 2/9, 2/23, 3/9, 3/23 & 4/6. With Deirdre Breen. Six-session study group combining Ayurveda and yoga. $300 includes private consult with Dr. Kaushik. Yellow Monkey Village, 792 Rt 35, Cross River. Info: 914.486.6480. New Year Journey Dance – 7-8:30pm. With Claudia Gukeisen. Discover healing power of journey dance. Tell one’s story to the dance floor and end with 20-min of guided divine sleep yoga nidra. $25. Mt Kisco. Claudia: 914.673.3314. Center4Healing.net. Introduction to Reiki Healing Energy – 10:30am-12pm.With Lia and Lisa, Reiki Masters. Learn how Reiki is used with children and animals. Helps develop intuition. Bring questions. Walk a Sacred Path Healing Center, 2279 Rte 22, Dover Plains. Info: 914.329.3325. Reiki I & II – 11am-4pm. With Reiki Master Marcus Feighery. $275. Synchronicity, 1511 Rte 22 Brewster. RSVP: 845.363.1765. Info: SynchronicityNY.com. Releasing Ceremony – 1-3pm. With Lia a Shamanic Reiki Master/Instructor. Transformation often follows conscious releasing. It’s empowering and freeing. $30. Walk a Sacred Path Healing Center, 2279 Rte 22, Dover Plains. Info: 914.329.3325. Trauma Informed Training for Healing Practitioners – 1-6pm. With Elisha Simpson. Training to learn new tools from field of trauma research. For those working with children or adults. $150. Sacred Spirit Yoga and Healing Arts Center, Dobbs Ferry. SacredSpiritYogaCenter.org. Exploring Self-Care – 5-7pm. With Danielle Guillet. Discuss and participate in several effective and easy self-care activities to relieve and manage stress. $35 preregistered. $40 door. Quest Yoga Arts, 11 E Main St, Mt Kisco. Register: 914.241.9642. QuestYogaArts.com. Monthly Manifesting – Noon-1:30pm.With Carla Blaha. $25. Synchronicity, 1511 Rte 22 Brewster. RSVP: 845.363.1765. Info: SynchronicityNY.com. Weiss Method Treatment Day NYC – 1-5pm. Free oneself of daily habits and addictions with the revolutionary help of the Weiss Method. Addiction Free Naturally, E 37th, btw Park and Lex. Reserve space: 914.705.1805. Weiss-Method.com. Reiki Master Program – 2-5pm. Opening session on energy development. 33 hour training for Reiki II students includes student teacher training, attunement training and master attunement in Armonk. $700 advance. Registration, Anne Bentzen, Reiki Master: 914.588.4079. Balancing4Life.com. StarVisions Healing Circle – 7-9pm. With Anne Bentzen, Reiki Master. Stress reduction and health enhancement achieved through deep relaxation with Reiki. Max 18. $20. Unitarian Universalist Fellowship, 236 S Bedford Rd, Mt Kisco. Must preregister: 914.588.4079. Men’s Open Circle – 7-8:30pm. Monthly meeting combining yoga and discussions supporting life off the mat. All ages. $20 donation. The Rivertown Center for Yoga & Health, 343 Broadway, Dobbs Ferry. Info, Scott Bierko: 914 384-9981. Register: RivertownYoga.com. Meditation/Reiki Circle – 7-8pm. Experience one-on-one Reiki in a group setting to help relax, ground and heal. Donation. Art of Astrology. Info: Julie at 914.835.7015. SpiritualHealingSpa.com. Osteoporosis Awareness Group – 7-9pm. Speaker: Chandra Sookdeo of Yonkers Wellness Center. Topic: Diet, Yoga, and Meditation for Osteoporosis. Free. Meetings held at Burke Rehabilitation Hospital, Bldg #4, 785 Mamaroneck Ave, White Plains. Info, Susan: 914.260.9339. All Levels Hatha Yoga Class – 9:30am. At the Patterson Rec Center, 65 Front St, Patterson, 845.878.7200. More classes will be offered. For yoga class info: 845.200.7462; yogainthetrees.com. Tween Yoga – June 2-30. 4-4:50pm. With Robin Cohen, RYT-500. Ages 10-14. $50 five-weeks. Preregister: 845.878.7800. InnerBalanceStudio.org. Overcoming Test Anxiety – 6-7:30pm. EFT workshop and group. Parent and child discover freedom and test success. $30. Putnam Healing Arts, Mahopac. RSVP: 845.228.8132. PutnamHealingArts.com. Klezmer Series Continues – 7pm. Traditional music with historic commentary provided by Sy Kushner. Recologie, 49 Lawton St, New Rochelle. Recologie, 49 Lawton St, New Rochelle. Info/reservations: 914.278.9350. Recologie.com. Nia Move & Restore – June 3-24. 7-8:15pm. With Cory Etheridge. Gentle, expressive body-mind-spirit movement blending aspects of martial arts, dance arts, healing arts and more. Quest Yoga Arts, 11-13 E Main St, Mt Kisco. Pricing Info/register: 914.241.9642. QuestYogaArts.com. The Transformative Practice of Lovingkindness – 7-9pm. With David Nichtern. Metta (Maitri) meditation, aka loving kindness. Tea and snack reception follow. $50. Quest Yoga Arts Studio, 11 E Main St, 2nd Flr, Mt Kisco. 914.260.1696. Info: TheCenterForHealthAndHealing.net. Moving Into Meditation – June 4, 11, 18 & 24. 10:50-11:50am. With Melanie Ryan. Gentle yoga to open the body and the chakras to release tension and blocked energy flow. Quest Yoga Arts Studio. Register: QuestYogaArts.com. Fashion Forward – 7pm. No sew clutch bags with Richela Fabian Morgan. Learn to make modern clutch bags—without needle and thread. $45 includes materials, wine and small bites. Recologie, 49 Lawton St, New Rochelle. Info/reservations: 914.278.9350. Recologie.com. The Healer’s Lounge – 10-11:30am. Free networking event for holistic practitioners. 30-45 min presentation by a holistic practitioner followed by networking. Bring marketing materials. Quest Yoga Arts Studio, 11 E Main St, Mt Kisco. TheCenterForHealthAndHealing.net. Teen Swim Yoga Fridays – June 5-26. 5-6pm. Designed for the teen swimmers focusing on flexibility, core strength and breath work to optimize performance in pool. Quest Yoga Arts, 11-13 E Main St, Mt Kisco. Pricing info/register: 914.241.9642. QuestYogaArts.com. Animal Totem Spirit Workshop – 6:30-8:30pm.With Alexandra Le’Clere. $35. Synchronicity, 1511 Rte 22, Brewster. RSVP: 845.363.1765. SynchronicityNY.com. Reiki 1 & 2 –10am-5pm. With Reiki Master Marcus Feighery. $275. Synchronicity, 1511 Rte 22, Brewster. RSVP: 845.363.1765. SynchronicityNY.com. Relax & Renew for Summer – 4-6pm. With Monique Michaels. Heart centered restorative practice gently opening the chest, shoulders, hips and back. Cleansing pranayama, rejuvenating restoratives and meditation. Quest Yoga Arts, Mt Kisco. Pricing info/register: 914.241.9642. QuestYogaArts.com. Develop Your Intuition on a Psychic Level –7-8:30pm. June 6, 9, 16, 23. With Joan Carra. Four week series to enhance intuitive abilities. Take one class or whole series. $30 per class/non-members; $108/members/series. Info: PsychicJoanCarra.com. Wainwright House, 260 Stuyvesant Ave. Rye. Register: Wainwright.org. Healing Circle – 7-9pm. With Katie Ciriello. Ancient sound healing techniques, crystal bowls, tuning forks and voice tones. Connect to soul. $45. The Center for Health and Healing, 153 E Main St, Ste A1, Mt Kisco. 914.260.1696. Register online TheCenterForHealthAndHealing.net. Intro to Earth Dance Workshop – 10:30am-12pm. With Jill Doornick, Express inner self and one’s relationship with the earth. Dance through the basic rhythms of the five elements. $22/$24. Wainwright House, Rye. Wainwright.org. Meditation and Satsang – 11am-12:15pm. 1st Sun. With Gabrielle Semel, E-RYT 500. Free. 845.878.7800. InnerBalanceStudio.org. HMN’s First Joint Chapter Potluck Picnic & Planting – 11am-2pm. Holistic Moms Network Northern Westchester /Lower Putnam & Southern Westchester Chapters. Evergreen Nursery, 688 Cross River Rd, Katonah. Info: Shira at: 914.861.5186. Join HMN: Membership.HolisticMoms.org. Book Signing and Jazz Event – 12-2pm. Creative Coalition’s The Art of Discovery published by Rizzoli. Literary and photographic project capturing that moment in time that can act as a personal muse and more. Recologie, 49 Lawton St, New Rochelle. Info/reservations: 914.278.9350. Recologie.com. Childbirth Education Series – June 7-21. 1-3pm. Prepare mind and body for labor and birth. Discuss stages of labor, typical medical interventions, expectations and healthy choices in childbirth. $180. Quest Yoga Arts, Mt Kisco. Register: 914.241.9642. QuestYogaArts.com. The Spirit of the Land: Understanding the Medicine Wheel in Multiple Dimensions – 1-3pm and/or 3:30-5:30pm. With Evan Pritchard, professor of Native American Studies. Each workshop: $35/$40, Wainwright House, Rye. Wainwright.org. Open House – 1:30-2:30pm and 3-4pm. Open level yoga classes. Free. Nueva Alma Yoga Studio, 799 McLean Ave, Yonkers. NuevaAlma.com. Diving Deep Within– 2-5pm. With Sudha Lundeen master teacher. For Sadhana and personal exploration in this season of renewal. $60.The Rivertown Center for Yoga & Health, 343 Broadway, Dobbs Ferry. Info, Beth Bierko: 914.384.9983. Register: RivertownYoga.com. Beginner Yoga Series – June 8-29. 10-11:15am. Safe, nurturing and inspiring journey. Step-by-step yoga breathing, core postures and the flow linking all these elements together. $100. Quest Yoga Arts, 11-13 E Main St, Mt Kisco. Register: 914.241.9642. QuestYogaArts.com. Flower Vibrational Healing Workshop– 6:30pm. With Annemarie Minke. Discover healing messages of flowers to rebalance energetic fields, enhance health and heal disease. Unitarian Universalist Fellowship, 236 S Bedford Rd, Rte 172, Mt Kisco. Register: 914.236.4503. StarvisionsCommunity.org. Adult Guided Channeling/Meditation Group – 7:15-8:15pm With Merrill Black, LCSW/Reiki Master. Unique theme, meditation, group discussion. $15. The Temperance Center, 453 White Plains Rd, Ste 203, Eastchester. 914.793.2600. TheTemperanceCenter.com. Accessing Energy, Intuition & Spirit for Healing – 1-3pm. Energy healing workshop. Restore peace, balance, mind, body, spirit. $30. Putnam Healing Arts, Mahopac. RSVP: 845.228.8132. PutnamHealingArts.com. Loving Our Addicted Daughters Back To Life – 6-7:30pm. Presented by Linda Dahl, local author of Loving Our Addicted Daughters Back to Life: A Guidebook for Parents. Q&A follow. Somers Library. Registration required: 914.232.5717. SomersLibrary.org. Green Drinks Westchester – 6-8pm. Meets this month at Sarah Lawrence College Center for the Urban River at Beczak, 35 Alexander St, Yonkers, with host Director Ryan Palmer. Facilitators: Lea Cullen Boyer and Dani Glaser. Fun night of networking; learn about this very special center. Facebook.com: search greendrinkswestchester. Summer Woes: Bugs, Ticks & Lyme Disease – 7-8:30pm. With Master Herbalist Andrea Candee. Learn how to protect the family (including pets) and discover innovative, successful techniques for addressing chronic Lyme. $38. Info: AndreaCandee.com. Wainwright House, 180 Stuyvesant Ave, Rye. Call to register: 914.967.6080. Northern Westchester Believe, Inspire, Grow Meeting – 12-2pm. BIG is a women’s empowerment organization designed to help women of all ages identify and embrace their true life purpose professionally and personally. The Burger Barn, Somers. 914.646.5766; BelieveInspireGrow.com. Clinical Canine Intervention Therapy Information Session – 7pm. Learn how to help individuals experiencing physical, social, emotional and other challenges through use of assistance dog training. Free. Sensory Stepping Stones, 83 S Bedford Rd, Mt Kisco. RVSP required: 914.244.4101. Moving Into Meditation– 10:50-11:50am. With Melanie Ryan. Weekly gentle yoga. Open the body and chakras to release tension and blocked energy flow. Sitting and walking meditation. Quest Yoga Arts Studio. Register: QuestYogaArts.com. Film: Project Wild Thing – 6:30pm/screening starts; 6:15pm/seating begins. Q & A following film. Free. Ossining Library’s Budarz Theatre, Ossining Public Library, 53 Croton Ave. 914.941.2416. Equine-Interactive Workshop – 6-8pm. Building rider confidence with Equine Energetix. Info: 212.477.4475. EquineEnergetix.com. Adult Guided Channeling Meditation Group – 7:15-8:15pm With Merrill Black, LCSW/Reiki Master. Unique theme, meditation, group discussion. $15. The Temperance Center, 453 White Plains Rd, Ste 203, Eastchester. 914.793.2600. TheTemperanceCenter.com. Japji Sahib Naad Yoga Workshop – 9am-12pm. With Gurunam Singh. Chanting, live music, meditation and Q&A. $63. 223 Katonah Ave, Katonah. 914.232.3473. GoldenTempleYoga.com. Open House –10am-1:30pm. Never tried Pilates? A day of free classes, raffles and demonstrations. The Art of Control on SUNY Purchase campus, 735 Anderson Hill Rd, Purchase. 914.251.7842. Etsy Artists Pop-Up Fair – 10am-4pm. 20 Etsy Artists exhibit hand-made designed product. Recologie, 49 Lawton St, New Rochelle. Info: 914.278.9350. Recologie.com. Yoga and Musculoskeletal Imbalances – 1:30-4:30pm. With Priti Robyn Ross. Explore principles for healthy alignment and discover personal postural habits. CEUs available. $35 members. $45 nonmembers. Wainwright House, 260 Stuyvesant Ave, Rye. Info, Michael Sassano: 914.709.4150. YTAYoga.com. Fur Ball Masquerade – 5pm. Bring an animal-themed mask. Attend formally dressed “to the nines.” Dancing, an award ceremony, silent and live auction and a raffle. Trump National Golf Club, 339 Pine Rd, Briarcliff Manor. Info: PetsAlive.org/furball2015. Dreaming with the Departed Workshop – 10am-1pm. With Janice Matturro, certified intuitive consultant and dream teacher. Such encounters can bring closure and healing and provide life-helping information. $54/$60, Wainwright House, Rye. Wainwright.org. Pilates and the Swedish Bar Workshop – 11am-2pm. Learn the benefits of Swedish Wall Bar and dozens of its classical exercises. $129. The Art of Control on SUNY Purchase Campus, 735 Anderson Hill Rd, Purchase. 914.251.7842. Strawberry Jammin’ Festival – 11am-4pm. Reggae music by the Big Takeover, tractor wagon rides, grilled food, children’s craft, strawberry shortcake and pick organically grown strawberries. Free admission. 9 Fishkill Farm Rd, Hopewell Junction. Info: 845.897.4377. FishkillFarms.com. South India Brunch – 12-4pm. Demonstrations by Rinku Bhattacharya. Part of a series presenting foods from four areas of India. Five-course vegan brunch. A savory experience. $45. Recologie, 49 Lawton St, New Rochelle. Info/reservations: 914.278.9350; Recologie.com. Laughing Yoga – 3-5pm. with Simeon Darwick. Practice offering deep learning with connection to others through humor and practice. $30. The Rivertown Center for Yoga & Health, 343 Broadway, Dobbs Ferry. Info, Beth Bierko: 914.384.9983. Register: RivertownYoga.com. Relax Deeply A Restorative Yoga & Meditation Class – 6-7:15pm. With Monique Michael. All levels. Unwind and de-stress body and mind. Breathe Pilates And Yoga, 83 N Greeley Ave, 2nd Flr, Chappaqua. Pricing info: 914.238.0184. BreathePilatesAndYoga.com. Kripalu Morning Yoga – 9-10:30am. Mondays receive individual attention in this creative, multi-level class. Letting go of stress, nurturing peace. First class free. Very experienced teacher. YogaShine Studio, 7-11 Legion Dr, Valhalla. 914.769.8745. Yogashine.com. Westchester Holistic Network – 8am-10am. Friendly people, compelling speaker. It’s not just for practitioners. Guest speaker is Manna Semby, Classical Homeopath and Educator. Free to members; $10 non-members. Panera Bread Company, One North Broadway, White Plains. Info: WestchesterHolisticNetwork.org. Author Series: Dancing Light, the Spiritual Side of Being through the Eyes of a Modern Yoga Master – 10:30am-12pm. With 96 year old Tao Porchon-Lynch. $15. $45 includes book. Wainwright House, Rye. 914.967.6080. Wainwright.org. Emotion Code – 1-3pm. Release stress, discomfort for self and pets. Experience amazing benefits, non-invasive healing modality. Bring stuffed animal. Putnam Healing Arts, Mahopac. 845.228.8132. PutnamHealingArts.com. Evening Satsang– 7-8:45pm. With Prem Sadasivananda. Meditation, chanting and dharma talk on stories that heal. $20 donation. The Rivertown Center for Yoga & Health, 343 Broadway, Dobbs Ferry. Info, Beth Bierko: 914.384.9983. Register: RivertownYoga.com. Adult Guided Channeling/Meditation Group – 10-11am With Merrill Black, LCSW/Reiki Master. Unique theme, meditation, group discussion. $15. The Temperance Center, 453 White Plains Rd, Ste 203, Eastchester. 914.793.2600. TheTemperanceCenter.com. Kripalu Evening Yoga – 7-8:30pm. Thursdays receive individual attention in this creative, multi-level class. Let go of stress. Experience nurturing peace. First class free. YogaShine Studio, 7-11 Legion Dr, Valhalla. 914.769.8745. Yogashine.com. Super Gentle Morning Yoga – 9:30-10:30am. Friday multi-level Kripalu-style for seniors and anyone with special needs and concerns. Gentle class. Receive individual attention. First class free. YogaShine Studio, 7-11 Legion Dr, Valhalla. 914.769.8745. Yogashine.com. The Vertical Workshop: Advancing and Progressing Clients – June 19-21. 12-7pm. With Shari Berkowitz. For teachers of Pilates: Rhinebeck Pilates. Pricing info/must preregister: 845.876.5686. RhinebeckPilates.com. Reiki Circle – 7-8:30pm. With Jackie Muller, LCSW, Reiki Teacher. $15. Inner Balance Studio, 1072 Rte 311, Patterson. InnerBalanceStudio.org. Second Annual Pelham Yoga Summer – 8-8:45am/registration; 9-10:30am/adult yoga class. Solstice event. Practice yoga outdoors. $20-$30. Register: ecopel.org. Chakra Flow-n-Let it Go Yoga – 11am-12:15pm. With Antonia Noonan. Open level using bija manta, vinyasa flow and restorative. $15. The Temperance Center, 453 White Plains Rd, Ste 203, Eastchester. 914.793.2600. TheTemperanceCenter.com. Third Sunday Community Yoga – 11-12:15pm. Admission by donation of personal care products for Pawling Community Resource Center. Inner Balance Studio, Patterson. InnerBalanceStudio.org. Restorative Yoga – 4-6pm. With Karla Diamond. Relaxing, powerful practice benefitting everyone. Release deeply held tensions, calm nervous system, strengthen immune system and increase self-awareness. Quest Yoga Arts, 11-13 E Main St, Mt Kisco. Pricing/Preregister: 914.241.9642. QuestYogaArts.com. Stress Making You Sick? – 1-3pm. Reduce stress, maintain health. Learn healing techniques. Balance mind, body, spirit. $30. Putnam Healing Arts, Mahopac. RSVP: 845.228.8132. PutnamHealingArts.com. StarVisions Healing Circle – 7pm. With Anne Bentzen, Reiki Master. Connecting wisdom and energy principles to life. Experience deep energy healing. Group setting. Max 18. $25. $15 student. Unitarian Universalist Fellowship, 236 S Bedford Rd, Mt Kisco Preregister: 914.588.4079. Holistic Moms Network Northern Westchester /Lower Putnam Chapter – 9:30-11am. Guest speaker Master Herbalist, Andrea Candee. Meet 4th Thurs of every month. Katonah United Methodist Church, 5 Bedford Rd, Katonah. Details, Shira, chapter leader: 914.861.5186. Join HMN: Membership.HolisticMoms.org. Law of Attraction Workshop – 6:30-8:30pm. With Carol Canter. $35. Synchronicity, 1511 Rte 22, Brewster. RSVP: 845.363.1765. SynchronicityNY.com. Explore Your Core Yoga Workshop – 9-11:30am. With Judi Friedman. Abdominal asanas strengthen and stretch the front, side and back bodies and abdomen, hips and spine. $45. Breathe Pilates And Yoga, 83 N Greeley Ave, 2nd Flr, Chappaqua. 914.238.0184. BreathePilatesAndYoga.com. Reiki 1 & 2 – 10am-5pm. With Reiki Master Marcus Feighery. $275. Synchronicity, 1511 Rte 22, Brewster. Register/info: 845.363.1765. SynchronicityNY.com. Harmony Qigong & Group Healing – 1-2:30pm. Qigong: the Movement of Life. Led by Master Robert Peng. $28 advance registration. Club Fit Jefferson Valley. 914.962.0101. Qigong Empowerment & Group Healing – 3:30-5pm. Qigong: the Movement of Life. $28 advance registration. Led by Master Robert Peng. Club Fit Briarcliff Manor. 914.962.0101. Tasseography: The Art of Tea Leaf Reading – 12-2pm. With Psychic Joan Carra. PsychicJoanCarra.com. Tea, coffee, pastries and intuitive inspirations. $32/$35Wainwright House, 260 Stuyvesant Ave, Rye. Register: Wainwright.org. Mandala Workshop: Moving Towards Wholeness – 1-4pm.With Doreen Grozinger. Creating mandalas offers time to quiet one’s minds in order to listen to inner self. $55/$60 materials included. Wainwright House, Rye. Wainwright.org. Is Your World Animate and Alive? – 7-9pm. With Shivananda Thomas Amelio. Explore and transform relationship with the world and everything in it. $55. The Rivertown Center for Yoga & Health, 343 Broadway, Dobbs Ferry. Info, Beth Bierko: 914.384.9983. Register: RivertownYoga.com. Achieve Goals: Release Fears with EFT – 1-3pm. Intro to EFT group. Restore peace, balance mind, body and spirit. $30. Putnam Healing Arts, Mahopac. RSVP: 845.228.8132. PutnamHealingArts.com.